The Federal Highway Administration (FHWA) defines pavement preservation as a program employing a network-level, long-term strategy that enhances pavement performance by using an integrated, cost-effective set of practices that extend pavement life, improve safety, and meet motorist expectations. Pavement preservation utilizes a combination of preventive and routine maintenance, with a heavy emphasis on prevention. The basic concept is that maintaining a road in good condition is easier and less costly than repairing one with heavy damage. The purpose of pavement preservation practices is to extend pavement life and arrest or retard deterioration and progressive failures. This maintenance strategy offers many benefits to road users as well. By keeping roads in good condition, preventive maintenance improves safety conditions. The ride quality of the road is also increased, making driving a more comfortable and pleasant experience for drivers and their passengers. Finally, preventive maintenance operations usually minimize traffic disruptions, thereby reducing congestion and lost time. The difference between the effect of preventive and reactive maintenance is significant. 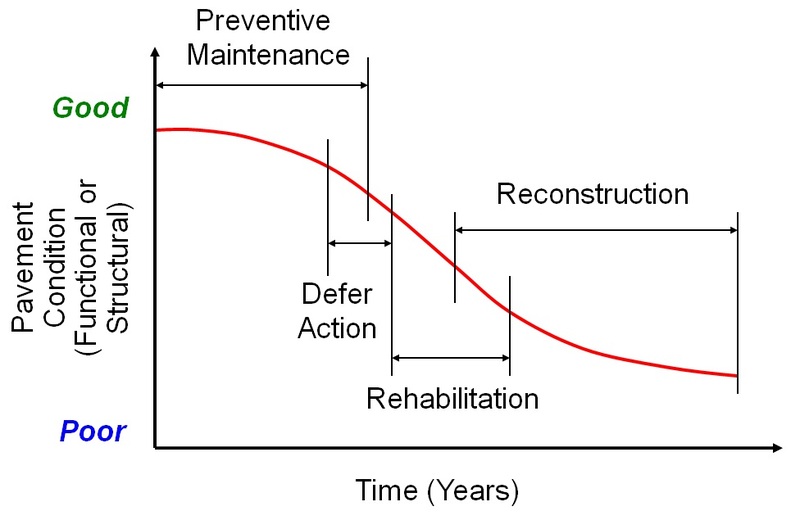 Not only is the timing of application different as shown in Figure 1-1, but the effect (represented by the slopes of the after-treatment performance curves) is also disparate. A pavement that receives preventive maintenance experiences only small fluctuations in pavement condition and generally remains serviceable. The pavement condition drops to an unacceptable level, however, with reactive maintenance, then is temporarily boosted before quickly receding once more. Figure 1-1. Effect of maintenance on pavement condition. Common preventive maintenance treatments are seal coats, microsurfacing, fog seals, crack sealing, joint sealing, thin overlays and others. Prevention means longer pavement life, better pavement performance, improved pavement condition and increased safety. TxDOT is able to make more informed decisions and the cost to the public is reduced. Because of improvements in safety, price, road condition, etc., public satisfaction with the local pavement management system will be heightened. Seal coats, also known as chip seals, are simple, relatively inexpensive pavement surfaces that are highly effective if adequate care is taken in the planning and execution of the work. A seal coat is an application of a layer of asphalt binder covered with a layer of aggregate applied to an existing paved surface. TxDOT spends close to $180 million annually maintaining 197,500 lane miles of roadway, and seal coats are a very important part of TxDOT’s preventive maintenance program. TxDOT state forces place approximately 3,000 to 4,000 lane miles per year and contracted seal coats comprise 17,000 to 20,000 lane miles per year. The average life of a seal coat or surface treatment is about six to eight years; however, some have performed successfully for periods of up to 20 years. TxDOT specification Item 316, Seal Coat, defines an application of asphalt material covered with a single layer of aggregate as a surface treatment. For purposes of this manual, an application of asphalt material covered with a single layer of aggregate when applied to a prepared compacted base is a surface treatment; whereas, a seal coat is applied to a paved surface. This manual is intended to provide guidelines for the design, construction, and inspection of seal coats and surface treatments for contract and state force work. Both full-width seal coats/surface treatments as well as strip/spot seal coats are addressed. The manual is directed primarily to office and field engineers, laboratory personnel, and field inspectors.